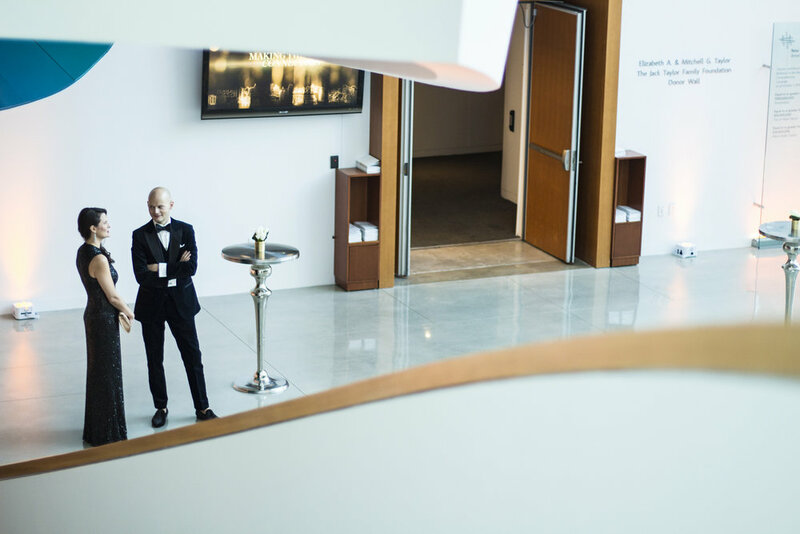 This year, the New World Symphony’s annual gala was an occasion to honor the organization’s dedication to community engagement initiatives. All proceeds from this spectacular soiree will help provide meaningful cultural programs to the South Florida community. The highlight of the New World Symphony’s 29th anniversary celebration was the much anticipated performance by the New World Symphony Fellows, with founder and artistic director, Michael Tilson Thomas, and Audra McDonald, six-time Tony Award-winner and National Medal of the Arts honoree. 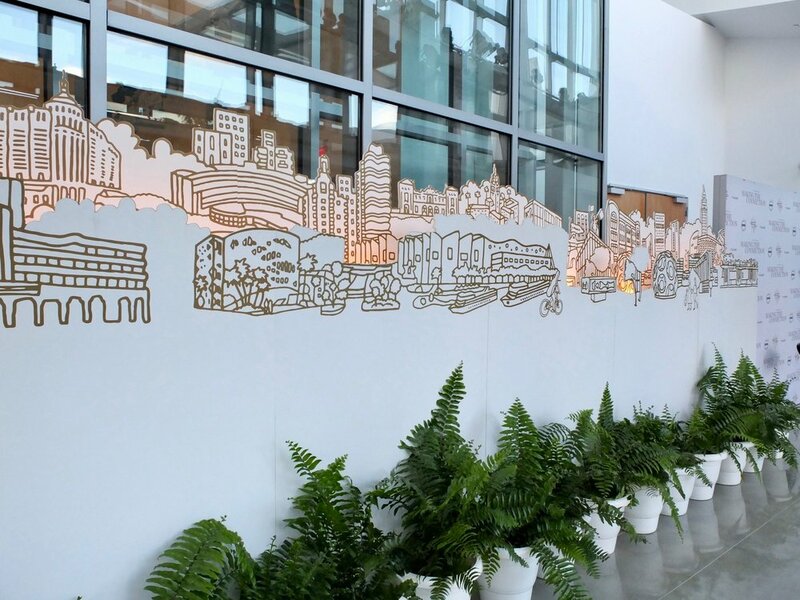 Guests arrived via the east entrance where the hallway was lined with a mural depicting cityscapes representing communities the New World Symphony connects with. The illustration was repeated throughout the venue, most notably on magnificent chandeliers in the Sun Trust Pavilion and the tent on the the rooftop. 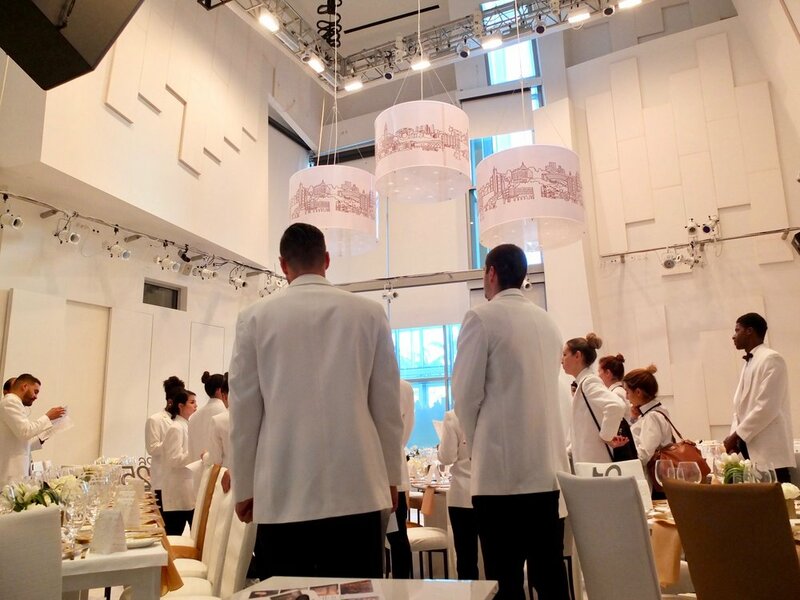 The Gala made use of the entire New World Center event space, starting with cocktails in the Atrium which was rapidly transformed into a dining area once guests moved to the Performance hall. The Sun Trust Pavillion's soaring ceiling featured the largest chandeliers with gold on white city skyline illustrations. While guests dined, staff transformed the Performance Hall into a late-night lounge for the after-party, with entertainment by the Michael Andrew Big Band. 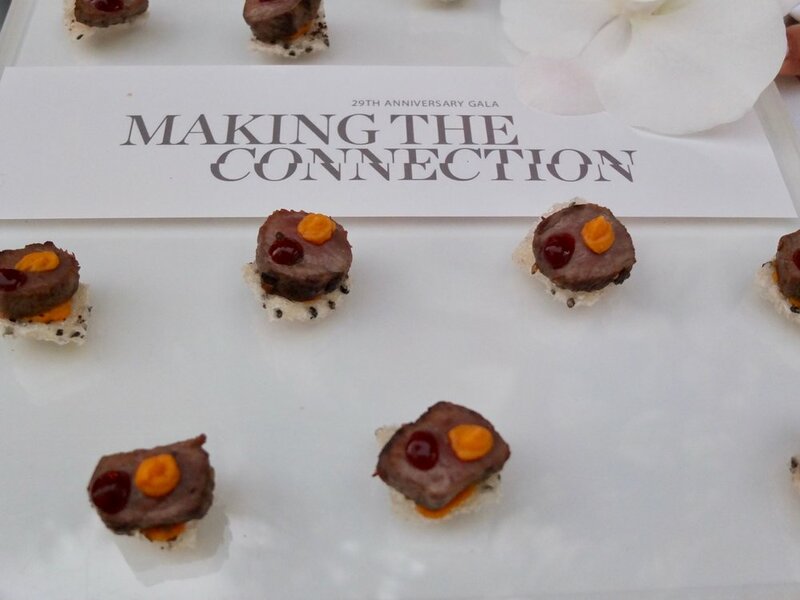 "How do you serve 800 people in 10 minutes per course," asks executive sous-chef, Michael Finizia. "How do you make award-winning restaurant-quality dishes in a catering setting and how do you serve food straight from the oven and not from holding cabinets?" "It's years of experience," Michael explains, "with meticulous planning and an army of orchestrated hands on site. 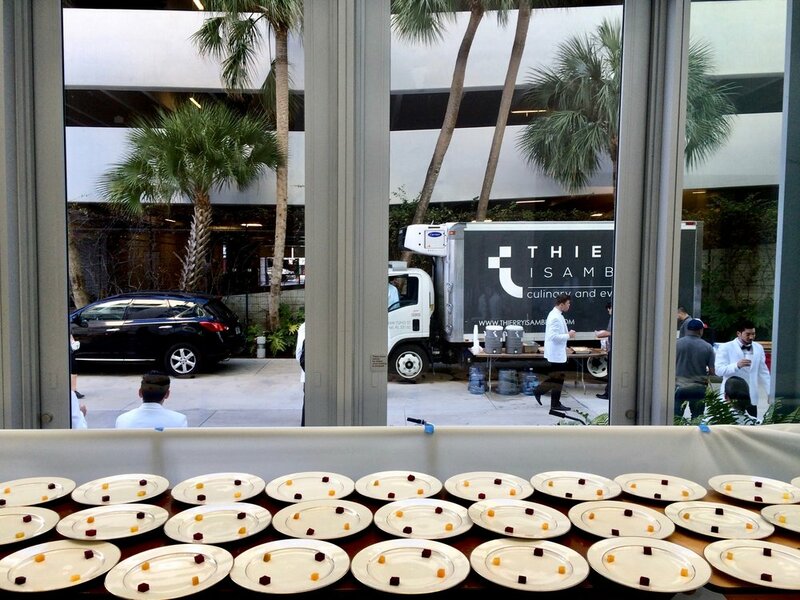 Months of planning results in precise logistical and production strategies, and menu planning paired with tastings brings focus to broad direction concepts." Michael goes on to say that timing is everything and catering is orchestrated with the precision of an air-traffic controller. "It's similar to planes in the air, if your timing is off, it's catastrophic. That's why everyone's movements are calculated with a safety net in mind, but when it flows, there is a symphonic quality to the process." 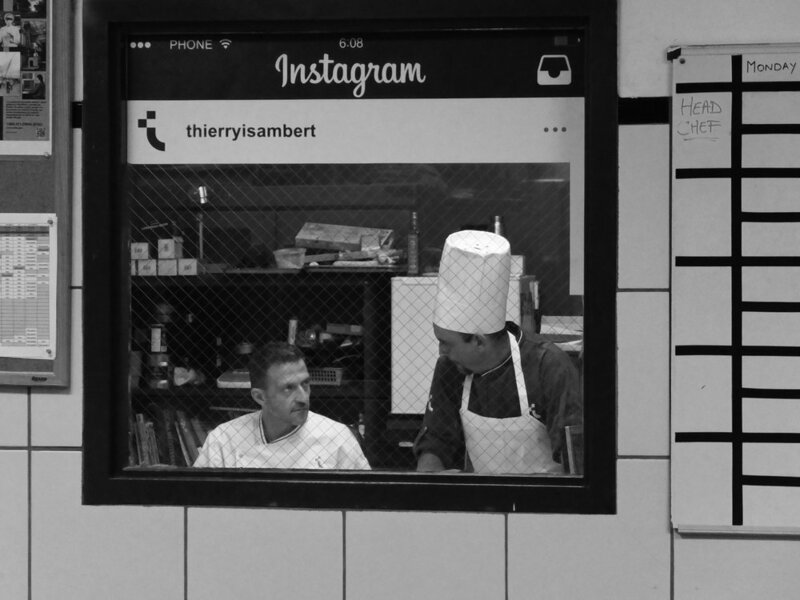 Executive Chef, Vincent Gourmet, oversees operations at the commissary. 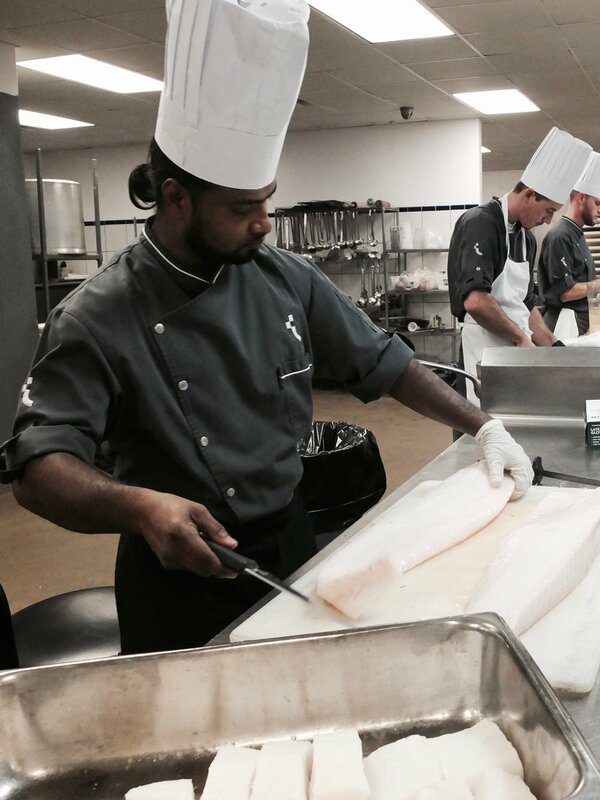 Bottom left: Executive sous-chef, Michael Finizia, prepping ingredients for one of the main course options: Vodka Sea Bass Brûlée, Candied Kumquats, Sunchoke Purée & grilled Asparagus.